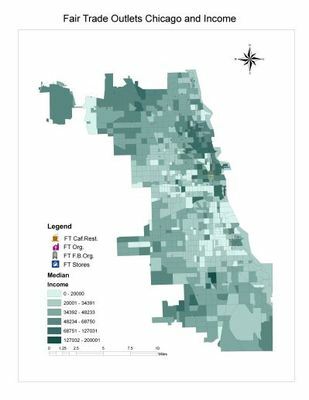 This map displays fair trade outlets and mean income levels by Chicago census tract. Fair trade outlets are separated into four categories: fair trade cafés and restaurants, faith based organizations, fair trade stores, and other fair trade organizations. According to the map, fair trade outlets are located primarily in community areas with higher average incomes.